B. thuringiensis (commonly known as 'Bt') is an insecticidal bacterium, marketed worldwide for control of many important plant pests - mainly caterpillars of the Lepidoptera (butterflies and moths) but also mosquito larvae, and simuliid blackflies that vector river blindness in Africa. Bt products represent about 1% of the total agrochemical market (fungicides, herbicides and insecticides) across the world. The commercial Bt products are powders containing a mixture of dried spores and toxin crystals. They are applied to leaves or other environments where the insect larvae feed. The toxin genes have also been genetically engineered into several crop plants (see Agrobacterium). The method of use, mode of action, and host range of this biocontrol agent differ markedly from those of Bacillus popilliae. Bacillus thuringiensis viewed by phase contrast microscopy. The vegetative cells contain endospores (phase bright) and crystals of an insecticidal protein toxin (delta endotoxin). 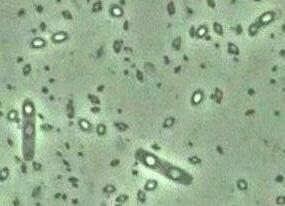 Most cells have lysed and released the spores and toxin crystals (the structures with a bipyramidal shape). The crystals are aggregates of a large protein (about 130-140 kDa) that is actually a protoxin - it must be activated before it has any effect. The crystal protein is highly insoluble in normal conditions, so it is entirely safe to humans, higher animals and most insects. However, it is solubilised in reducing conditions of high pH (above about pH 9.5) - the conditions commonly found in the mid-gut of lepidopteran larvae. For this reason, Bt is a highly specific insecticidal agent. Once it has been solubilised in the insect gut, the protoxin is cleaved by a gut protease to produce an active toxin of about 60kD. This toxin is termed delta-endotoxin. It binds to the midgut epithelial cells, creating pores in the cell membranes and leading to equilibration of ions. As a result, the gut is rapidly immobilised, the epithelial cells lyse, the larva stops feeding, and the gut pH is lowered by equilibration with the blood pH. This lower pH enables the bacterial spores to germinate, and the bacterium can then invade the host, causing a lethal septicaemia. Recent studies on the delta-endotoxin structure show that it has three domains. 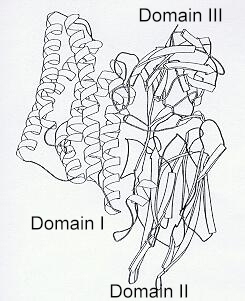 Domain I is a bundle of 7 alpha-helices, some or all of which can insert into the gut cell membrane, creating a pore through which ions can pass freely. Domain II consists of three antiparallel beta-sheets, similar to the antigen-binding regions of immunoglobulins, suggesting that this domain binds to receptors in the gut. Domain III is a tightly packed beta-sandwich which is thought to protect the exposed end (C-terminus) of the active toxin, preventing further cleavage by gut proteases. Interestingly, the diphtheria toxin (of another bacterium) has an essentially similar structure to the Bt toxin. Bacillus thuringiensis was first discovered in 1911 as a pathogen of flour moths from the province of Thuringia, Germany. It was first used as a commercial insecticide in France in 1938, and then in the USA in the 1950s. However, these early products were replaced by more effective ones in the 1960s, when various highly pathogenic strains were discovered with particular activity against different types of insect. For many years, Bt was available only for control of lepidoptera, using a highly potent strain (B. thuringiensis var kurstaki). This strain still forms the basis of many Bt formulations. Further screening of a large number of other Bt strains revealed some that are active against larvae of coleoptera (beetles) or diptera (small flies, mosquitoes). Most of these strains have the same basic toxin structure, but differ in insect host range, perhaps because of different degrees of binding affinity to the toxin receptors in the insect gut. For example, the toxins produced by B. thuringiensis var aizawai have somewhat different toxins from those of B.t. var kurstaki and they are highly specific to lepidoptera, with no effect on other insects. The many commercial strains for control of lepidoptera are marketed under various trade names such as Biobit�, Dipel�, Javelin�, etc. In contrast, the toxins produced by strains of B.t. var israelensis are highly active against simuliid blackfly vectors of some tropical diseases, and also against fungus gnat larvae and some types of mosquito (especially Aedes species, but higher toxin doses are needed for control of Culex spp. and Anopheles spp.). Trade names for these products include Skeetal�, Vectobac� and Mosquito Attack�. Strains of B.t. var san diego or B.t. var tenebrionis are marketed for control of some coleoptera - especially for control of the important Colorado potato beetle. B. thuringiensis strains produce two types of toxin. The main types are the Cry (crystal) toxins, encoded by different cry genes, and this is how different types of Bt are classified. The second types are the Cyt (cytolytic) toxins, which can augment the Cry toxins, enhancing the effectiveness of insect control. Over 50 of the genes that encode the Cry toxins have now been sequenced and enable the toxins to be assigned to more than 15 groups on the basis of sequence similarities. The table below shows the state of such a classification in 1995, but an alternative classification has recently been proposed. It has been known since the 1980s that the Cry toxins are encoded by genes on plasmids of B. thuringiensis. There can be 5 or 6 different plasmids in a single Bt strain, and these plasmids can encode different toxin genes. The plasmids can be exchanged between Bt strains by a conjugation-like process, so there is a potentially wide variety of strains with different combinations of Cry toxins. In addition to this, Bt contains transposons (transposable genetic elements that flank genes and that can be excised from one part of the genome and inserted elsewhere). All these properties increase the variety of toxins produced naturally by Bt strains, and provide the basis for commercial companies to create genetically engineered strains with novel toxin combinations. One of the first such products was a Bt strain marketed as Raven� for enhanced control of Colorado potato beetle as well as for caterpillars that attack potato, tomaot and aubergine plants (all of which are in the same plant family - Solanaceae). This Bt strain contained two different beetle-active Cry III proteins (with different binding affinities for midgut cell membranes of Colorado beetle) as well as two caterpillar-active Cry I proteins. Such an approach - often termed gene pyramiding - is designed to delay the development of resistance in target pests, because resistance would have to develop simultaneously to several different toxins. Such resistance can develop quite rapidly when only one type of toxin is involved. In fact, it happened within 1 or 2 years when the mosquito-active Bt strains were widely used in tropical countries. The basis of resistance seems to be complex, involving several factors. But one encouraging finding is that, at least in some insects, the receptor for the Bt toxin is an essential gut enzyme, aminopeptidase-N, so any change in this receptor that causes a loss of binding to the toxin could also be detrimental to the insect, potentially reducing the fitness of the resistant insects. Since 1996, a wide range of crop plants have been genetically engineered to contain the delta-endotoxin gene from Bacillus thuringiensis. These "Bt crops" are now available commercially in the USA. They include "Bt corn", "Bt potato", "Bt cotton" and "Bt soybean". Such plants have been genetically engineered to express part of the active Cry toxin in their tissues, so they kill insects that feed on the crops. In some respects, this is an important technological and practical development, because it ensures that only those insects that attack the crop will be exposed to Bt toxins - there is no risk to other types of insect. It also ensures that the range of uses for Bt is extended to insects that feed on the roots or that bore into the plant tissues - for example, the European corn borer - because such insects cannot be controlled by Bt suspensions sprayed onto plant surfaces. However, there is also a "downside", because the target insects are perpetually exposed to toxins and this creates a very strong selection pressure for the development of resistance to the toxins. Various crop-management strategies are being developed to try to minimise this risk. Knowles, BH (1994). Mechanism of action of Bacillus thuringiensis insecticidal delta-endotoxins. In Advances in Insect Physiology, Volume 24 (ed. PD Evans) pp.275-308. Academic Press, London. Biocontrol Science and Technology Volume 4 (1994). Special issue: OECD Workshop on Ecological Implications of Transgenic Crops containing Bacillus thuringiensis Toxin Genes. Information Systems for Biotechnology - News Report, December 1995. Gives good coverage of the whole subject. Briefing paper for a Third World Network: working group on Biosafety, October 1998. Strongly recommended: Management of Resistance to Bacillus thuringiensis toxins. (May 2000 paper by Camilla Neppl). GO TO FULL LIST OF PROFILES?